When we left you last, we were on our way into Boise, planning on enjoying most of a month there. We did that! We spent lots of time with Natasha, Seth and grandson Archer. Archer was Elvis for Halloween – he was so cute! 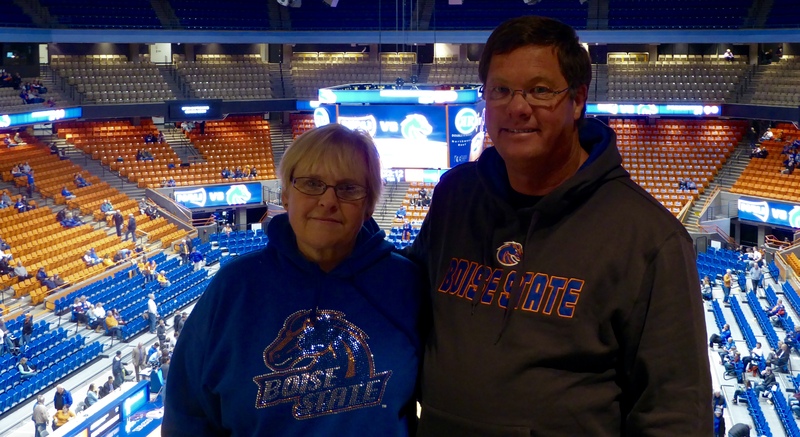 We spent time with friends and went to Boise State football and basketball games. We enjoyed being back at our church. We walked the greenbelt along the Boise River several times daily. We re-licensed the trailer and the truck and Randy got a 50 gallon fuel tank installed. All three of us did the dreaded annual doctor visits. The snow started falling in mid-November and it was time to move on! This far north… in the snow… This is no place to be if you live in a trailer! Our plans were to head to Vancouver to spend a week with my parents and then have a family Thanksgiving in eastern Washington. 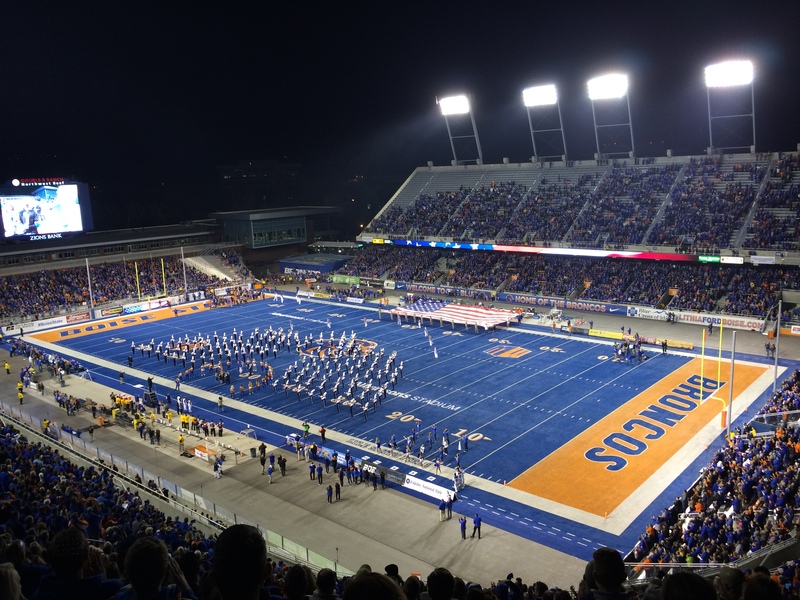 Then we planned to head south, see some friends on the way, eventually catching up with the Boise State football team for their bowl game before settling in Arizona for the winter. 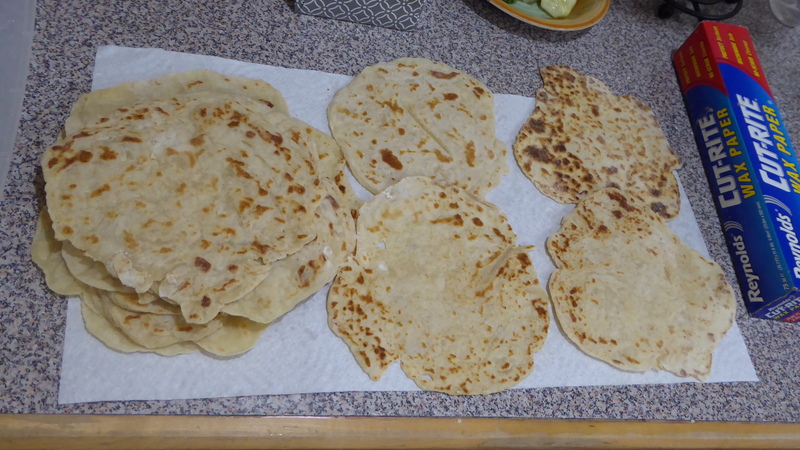 One afternoon, Mom and I decided we would make lefse – a family tradition from my paternal grandmother. 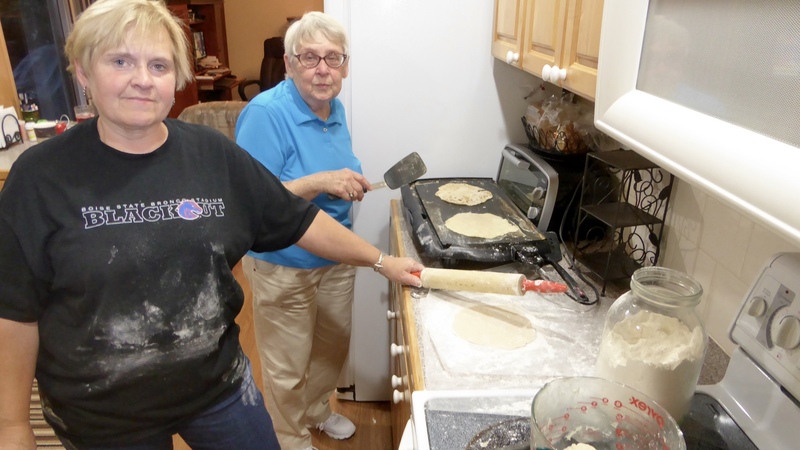 Although we took a short cut using mashed potatoes – the end result was just fine! 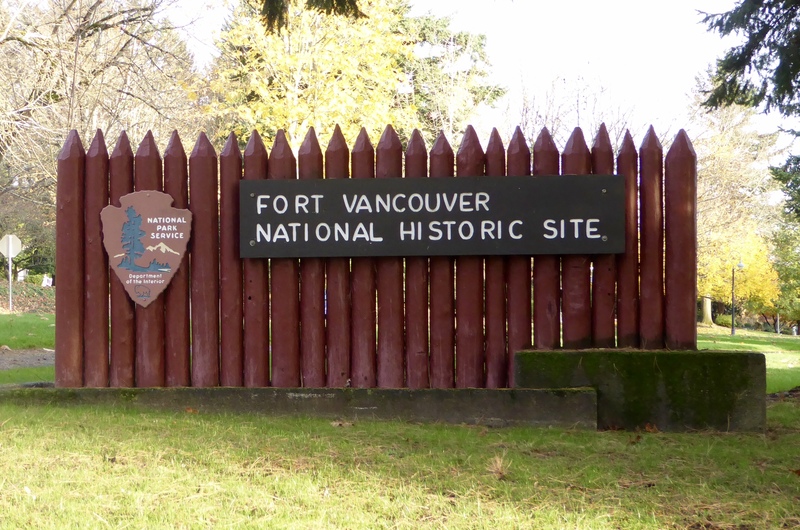 Another afternoon we went to the Fort Vancouver National Historic Site. This is a very expansive property and we were there a on a very cold, late afternoon. We committed to returning another warmer someday and only ventured into the visitor center and the Marshall House. The Marshall House is one of 22 fully restored homes on Officer’s Row. Two of them are open to the public. 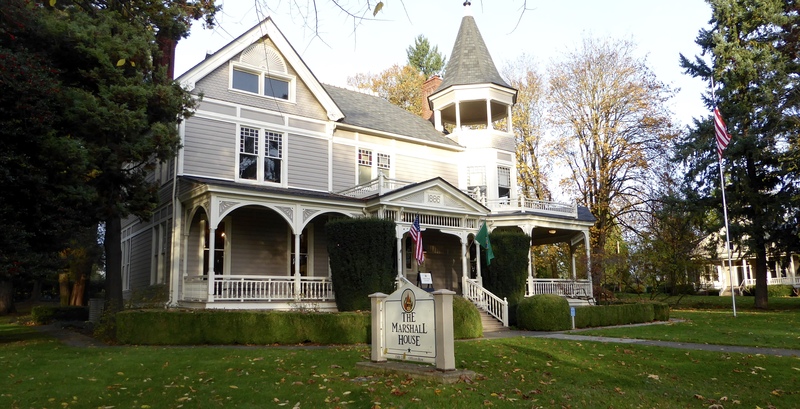 The Grant House was home for post commanders and is now a restaurant. 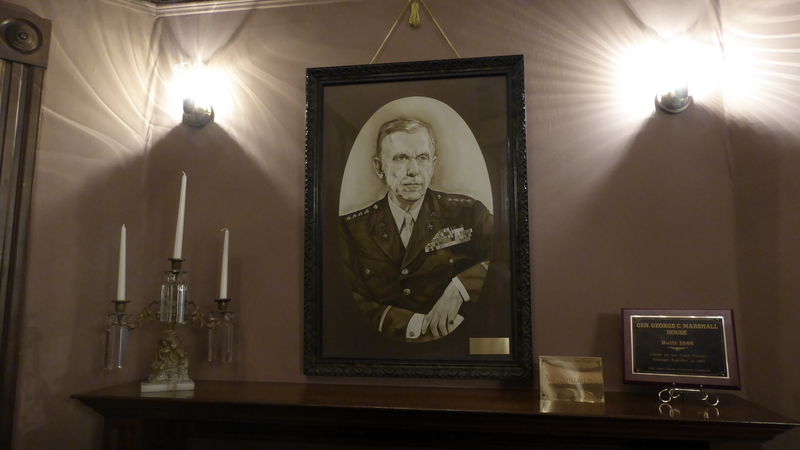 The Marshall house is named for General George C Marshall who served as commander of Vancouver Barracks from 1936 – 38. And who was General George C. Marshall? In addition to being the Barracks commander, he served in both World Wars and rose to be US Army Chief of Staff. He was responsible for taking an army of less than 200,000 soldiers when WWII started and building it into a well trained, well equipped force of 8,300,000 four years later. After WWII, he became Secretary of State and created the Marshall Plan for European Recovery. 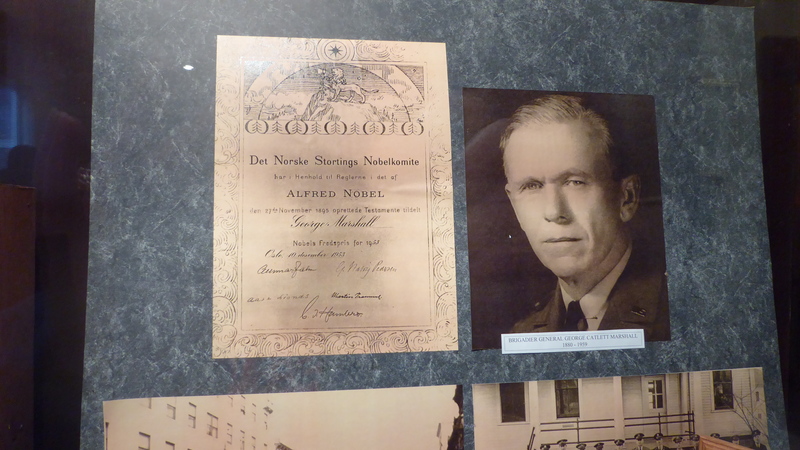 He received the Nobel Peace Prize in 1953. Remember the dreaded annual doctor visits I mentioned earlier? 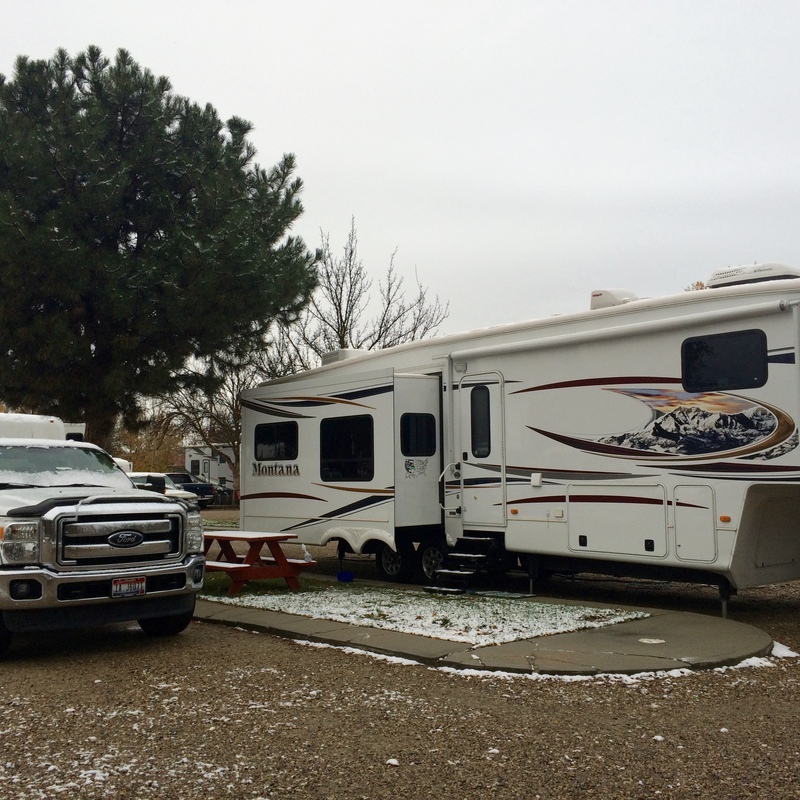 While we were still in Vancouver, one week out of Boise, Randy got the call from one of his doctors that she didn’t like his test results and we needed to come back to Boise. En-route, we were able to go to our family Thanksgiving in the Tri-Cities, home of Aunt Bonnie and Cousin Lisa and her family. 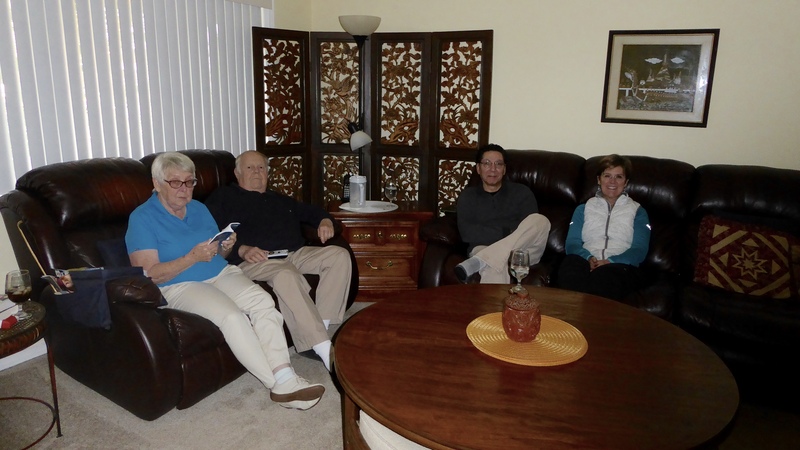 We had a nice time visiting, playing cards and watching football. 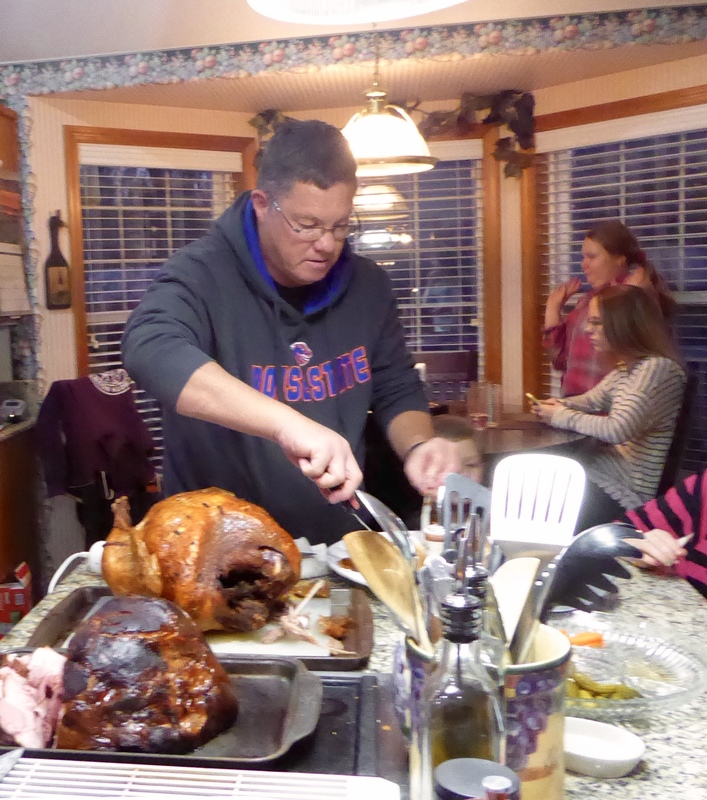 Though they did almost all of the work for Thanksgiving dinner, Randy did carve the turkey. Over the last year and a half we’ve always been so happy to return to Boise. It felt very strange to be so unhappy about it this time- of course, we had the medical stuff to be concerned about and we’d only been gone for 10 days. We came back on November 28 to frigid temperatures. Randy had his first tests on November 30 and the temps were still frigid. We were using and refilling a seven gallon tank of propane every other day to keep the waterlines in the enclosed underside of the trailer from freezing. Thankfully the deep freeze broke up after a week or so and unseasonably warm weather came in. We are again seeing Natasha, Seth and Archer. I joined the Christmas Choir at church and we are again enjoying time with friends. We are going to Boise State basketball games and seeing lots of matinee movies (4 this week). On the medical side, things are moving frustratingly slowly. Randy’s doctor was on vacation this week (of course) and his next set of tests (surgical) are on December 18th. Because of Christmas, we won’t get results, or have an idea where we go from here, until December 28th. We don’t know if we’ll be heading south (as we had planned over a month ago) the very next day, the next month, or at all this winter. Prayers are most welcome. The RV park manager has been terrific. We didn’t pay for our site at all while we were waiting to see if we were going to be here for just days, or for a week, or for a month (rates are less expensive by the month). She said we could have our favorite site until April if needed- but then someone else had it reserved. Oh wait – we are the ones who have it reserved in April! By far the most gratifying part of being back during this difficult time, is the number of friends who have invited us to winterize our trailer and move in with them. There have been at least a dozen offers. We hope to be able to live in our trailer but if we end up staying in Boise into January and beyond, we may very well take someone up on the offer. Even though our plans went south, when we did not, what a wonderful place it is that we call home. Prayers and positive thoughts during this bump in the road. Thank you. We appreciate both. Mom and dad will always know what is going on – feel free to ask if I get distracted. I am very sorry to hear of Randy’s medical concerns, and hoping the best for you both! Yep, God’s got a plan – it is just different than ours was.